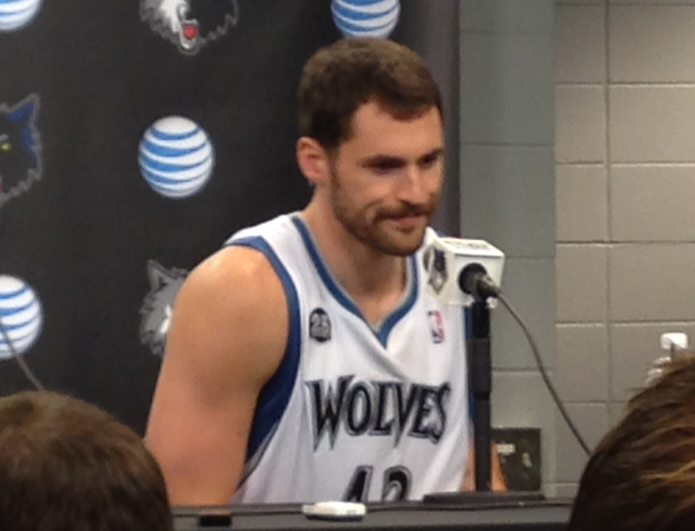 Last night, the Timberwolves lost another game. Not just another game, but they lost another home game, and another home game against a mediocre opponent. This time it was the Milwaukee Bucks, who came into the contest rocking a 13-21 record, near the bottom of the Eastern Conference. The Wolves lost for a variety of reasons. They shot the ball poorly; even rookie phenom Karl-Anthony Towns, whose shot is one of the few reliable things about this year’s team. After stingy defense in the first quarter, led by the usual cast of defensive characters — Ricky Rubio, Tayshaun Prince, Kevin Garnett — they defended worse and worse as the game went on, surrendering dunks out of pick-and-roll sets down the stretch of the game. They ended up losing by 10 points, after leading by 17 at one point, late in the first quarter. It was one of the team’s ugliest performances of the season. Afterward, the wait for Coach Sam Mitchell was longer than usual. Chatting with fellow bloggers in the media room, I joked that someone should open with a question about Zach LaVine’s huge alley-oop dunk; it came late in the game, after the damage had been done, and if nothing else probably upset Mitchell even more. The spectacular dunk, in the context of a terrible performance, highlighted the apparent gulf between his young players’ physical potential and their realized basketball ability. Nobody asked that question, and that was certainly for the best. Not only because it would have been silly and ruined the presser, but because Mitchell was ready to talk last night, and get something off of his chest. Mitchell wanted to talk AAU basketball, and what it’s done to spoil the young players on his Timberwolves team. The bad habits that they have developed as a result of “coaching” from the likes of non-coaches such as “the guy who owns the hardware store” and “some dude that’s got some money for sneakers and gear.” William Bohl typed up the full quote at A Wolf Among Wolves, and I encourage you to check it out in full. This quasi-ideological rant against The State of Basketball by Mitchell was met with a wide range of reactions on Twitter. I personally loved it, but that had more to do with the insight we were provided about How Sam Really Feels than any clear agreement with what he was saying. There are plenty of old school, former players willing to denounce modern basketball. The high-profile examples of late usually involve the Golden State Warriors championship-winning style of play. Charles Barkley focuses on their lack of interior size, and how (he believes) they would lose to teams from his era. Mark Jackson believes that Steph Curry is “hurting the game” because of how young kids are shooting too many long jumpers before rounding out their complete skill sets. When these people say these things, the NBA blog engines heat up with reaction pieces, and Twitter arguments ensue. This AAU thing of Mitchell’s is common, it’s not new, and it blends in with the related discussion about college basketball as training for the pros, as opposed to allowing and encouraging the most talented players to enter the NBA as early as they possibly can. But the general discussion about how 18, 19 and 20 year olds prepare for their futures in basketball is not usually as specific as Mitchell’s was, so let’s think about What He is Saying when he says these things after a bad loss to the Bucks. First, Mitchell is focusing on “stance.” He’s focusing on the stance that his young players are [not] in, on both ends of the floor. Instead of having their knees bent at all times, he’s noticing that they stand up, which is more of a resting position than a basketball-ready one. On defense, he mentioned how they had to do “slide drills” in training camp, an unanticipated degree of basic that Mitchell felt should have been better coached to these guys when they were younger. On offense, he mentioned how they catch the ball “standing up” and bring the ball up over their head, as opposed to clearing through in a real triple-threat position. Evaluating NBA coaching performance is a difficult and imperfect exercise. This is because the overwhelming majority of the work done by coaches happens during the part of the season that outsiders are not privy to; basically, everything outside of the in-game experience. Coaches prepare and conduct practices, scout opponents and present reports to the players with game-to-game strategies. These include their own plans of attack on offense and how to counter the opposition with defensive matchups and principles. While trying to carry out these fundamental tasks, NBA coaches are often faced with the less scientific duty of managing egos and expectations; egos and expectations of twenty-somethings earning million-dollar salaries. With a decision to insert Player X into the starting lineup comes the task of telling Player Y that he’s now coming off the bench. Unlike fans managing their fantasy or 2K rosters, this cannot be done coldly and without regard for the human elements. Coaches do other things too, like coordinate organizational priorities with the front office. This can mean emphasizing the development of young talent over “winning now.” Who needs to play, and who might need to be traded? In places like Houston, it seems like the coaches are required to implement specific x’s and o’s tactics, such as the three-point shot. Coaches need to speak to media on essentially a daily basis, which can be difficult when trying to both maintain positive vibes with the fan community while not disclosing sensitive or secret material. Despite this mountain of data that we do not and never will possess, we still sound off on coaching performance and talk ourselves into some pretty high levels of certainty about who are the best and worst in the profession. People generally agree that Gregg Popovich is a great coach, and Byron Scott is a bad one. In recent years in Minnesota, it has seemed like a coaching-competence roller coaster going from Dwane Casey (good) to Randy Wittman (bad) to Kevin McHale (good) to Kurt Rambis (bad) to Rick Adelman (good) and then to Flip Saunders and his unexpectedly-quick replacement, Sam Mitchell, whose job is just beginning. 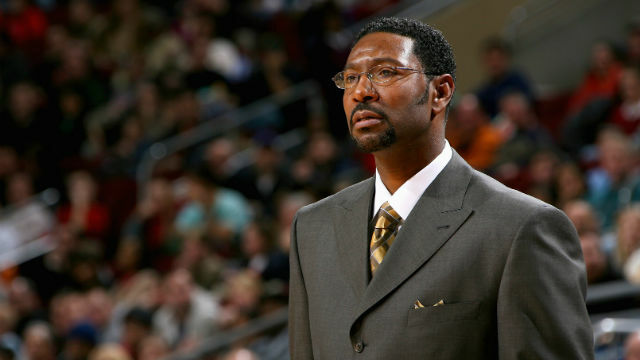 How good of a job is Sam Mitchell doing? How would we measure it? INBOX: Why is Shabazz Muhammad Struggling So Far? Andy G: Any theories on why Shabazz Muhammad is struggling so far? After his 2014-15 breakout season was interrupted by injury, Shabazz came to training camp in the best shape of his life. Big(-ish) things were expected. Certainly bigger than what he has shown in the Wolves’ first seven games. (1) His playing time fluctuates and he doesn’t know his role. (2) He isn’t playing to his strengths like he used to because he “expanded his game” over the summer and is still trying to figure out when/where to use his new skillz within the framework of his role. (3) He isn’t used to playing with ball movers like Rubio and Towns. Those guys are obviously a net + for the offense, but Bazz came up playing without any good passers, so he focused all of his attention on being a junkyard dog who made his own offense from offensive rebounding and general relentlessness rather than exploiting good spacing and passing from talented teammates. (4) Some combination of 1, 2, and 3. (6) Personal issues we’re unaware of. And that is exactly what will happen, starting when training camp breaks on September 28. The Timberwolves will have a new head coach, and that coach will be treating this team as his own. More than once yesterday Mitchell emphasized that he’ll continue to implement Flip’s system but also that he will have the freedom to coach the team as he sees fit. Parsing Sam’s words in finer detail, he used the word “I” (as opposed to, say, “we”) when stating “I have a great staff,” and “I have great assistants.” He’s going to take ownership of this opportunity. As he should. The Wolves need a real coach with real ideas and real authority to act on them much more than they need a substitute teacher or babysitter for a few months. Some of these players are just beginning what figure to be long, successful careers. This NBA schedule isn’t moving anywhere to accommodate this unfortunate Timberwolves development, so they need to roll with it as best as possible. Right now, Sam Mitchell is Andrew Wiggins’s coach. He’s Tyus Jones’s coach. He’s Karl-Anthony Towns’s coach, and he is Ricky Rubio’s coach. It is a reality that almost certainly has not sunk in for these guys, but it needs to soon, and it will soon. It is reality. Mitchell has been a head coach. With the Toronto Raptors from 2004 to 2008, he amassed a win-loss record of 156-189. That .452 winning percentage is better than it seems, because those teams were not very talented, outside of superstar Chris Bosh. In 2007, Mitchell was named NBA Coach of the Year after leading the Raps to 47 wins and a playoff berth. After Bosh, that team’s minutes leaders were Anthony Parker, T.J. Ford, Jorge Garbajosa, Rasho Nesterovic, and Andrea Bargnani. While I often point to this season as “Chris Bosh is underrated” evidence, it also suggests that Mitchell can coach. The Raptors fired him early in the 2008-09 season when they had an 8-9 record. Jay Triano took over and they went 25-40 the rest of the way. The most interesting thing to watch will be how Mitchell balances the “win now versus develop young players” dynamics. Make no mistake about it: If he isn’t auditioning for the longer-term Timberwolves head coaching job (he probably is) then he is at least auditioning for the other 29 teams who might have vacancies for him to explore in the near future. If the Wolves come out of the gates winning — maybe .500ish at the All-Star break — Mitchell’s name will be a hot one like it was in 2007, and he’ll probably be a head coach again soon. He understands this. But if these wins come more on the achy bones of Kevin Martin, Garnett, and Andre Miller, and less on the ascents of LaVine and Towns, it might not be What Flip Would Want. It’s early. Too early to engage in that much speculation. But Mitchell’s old school, tough-guy reputation precedes him here. It will not be altogether surprising if the freedom he assumes will bring substantive changes from the alternate universe where Saunders coaches this team, this season.